If you have ever wanted to see the wonders of the deep blue sea, then taking a snorkeling trip is your absolute best bet. An underwater exploration may just be exactly what you need to cure your hangover from visiting too many museums, historical sites, and souvenir shops. 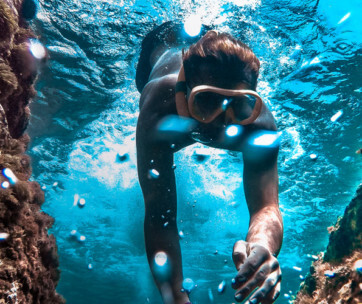 Whether you want to learn more about the different ecosystems of marine life, or you simply want to get up close and personal with a stingray or a shark, you should definitely put snorkeling in the itinerary of your next trip. 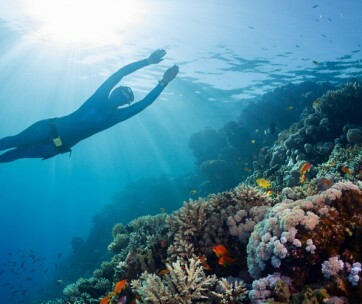 Snorkeling is commonly defined as the practice of swimming through a body water – this could be a lake, sea, or ocean – while equipped with a snorkel mask, a breathing tube (the snorkel), and sometimes, snorkeling fins. Some masks even come with built-in snorkels. Although not necessary for snorkeling, a wet suit may also be worn, especially during colder seasons. When you’re just starting out with snorkeling, stick to warm and calm bodies of water. The lessened occurrence of waves and ripples will let you keep your proper form and momentum as you move through the water. As you get more used to being in the water, then maybe you could move on to rougher waters. However, you should keep in mind that this doesn’t necessarily mean you’ll see more marine life if you explore here. Some of the most sought-after snorkeling spots are famed for their beauty that you can clearly see thanks to clear, calm waters. Snorkeling is great fun for the kids and it can be enjoyed by old folks as well. This is a safe way to look at the fishes and their corals because you don’t really go that deep. 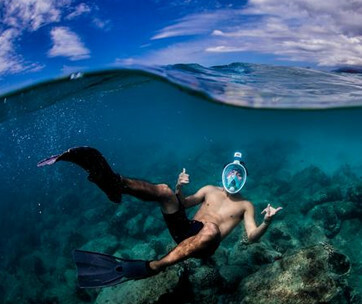 With snorkeling, you’ll be staying close to the surface of the water on most occasions. You don’t even need to be completely underwater to enjoy all of its wonders. Snorkeling is also easier on the budget. For starters, the equipment used doesn’t cost a whole lot. You also don’t need a certification or a qualification to do it. More often than not, you also don’t need a guide to go snorkeling. Having to avail of all of these things would’ve really driven the price tag up. How is it Different from Scuba Diving? Now that we’ve talked about what exactly snorkeling is and how it is done, let’s now differentiate it from an activity that’s quite similar: scuba diving. Snorkeling does not let you as deep and as for long as scuba diving. You’ll be relying more on your lung capacity and proper breathing techniques, as opposed to an external breathing apparatus. According to many people who have tried both, snorkeling is also much less physically demanding compared to scuba diving. This is why it is perfect for both the much younger and older populations, as mentioned before. Up first on the list of the best snorkeling spots in the world is Key Largo, located in Florida. This is the northernmost part of the Florida Keys and also the biggest. If you choose to go snorkeling here, you’ll be able to see a variety of wildlife. 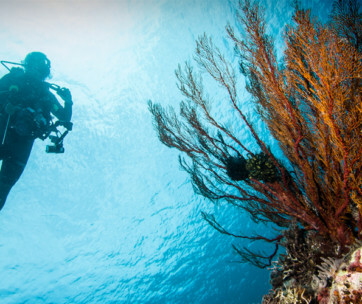 You’ll witness everything from different species of fishes to the famed corals of Molasses Reef. There are also sightings of shark, turtles, and stingrays around this area often. For something a bit more historical, you could also pay a visit to the Christ of the Abyss Statue at the John Pennekamp Coral Reef State Park. There were many people who were worried about how recent natural disasters that hit the sunshine state such as Hurricane Irma back in 2017 would affect how this key looks as well as its operations. It’s a good thing that Key Largo was smack dab in the eye of the storm. Due to the fact that this snorkeling spot was in the middle of the storm, it was left largely intact. No corals and other habitats were destroyed, and no species were displaced from the places they call their home. If you ever find yourself in Asia, then you may want to hit up the second spot on our list – the Komodo National Park in Indonesia. As its name suggests, this over 30-year World Heritage Site is one of the few places in the entire world that serves as a natural habitat for the Komodo Dragon. In spite of the fact that most people only go here for them, the snorkeling spots here should also not be overlooked. Being a heritage site, as mentioned, means that the animals and reefs here are heavily protected. Unlike in more public domains, they are allowed to flourish instead of being exploited. The regions for snorkeling in the Komodo National Park aren’t only maintained by people who are hired to do so. Cold water also naturally flows through these spots courtesy of the much larger Indian Ocean. This water helps provide a lot of essential nutrients to this area, which helps keep the marine life healthy. You won’t run out of sights to see if ever you find yourself in this region of Indonesia. At number three on this list is Ilha Grande, which is located off the coast of Brazil somewhere in between São Paulo and Rio de Janeiro. Like many of the spots on this list, Ilha Grande is well-protected, which allows it to keep much of its natural beauty. Even though there are hotels, restaurants, and other forms of commercial establishments located on the island, it still allows you to feel connected with nature because of its abundance of thick monkey-filled jungles and bodies of water inhabited by different sea creatures. The Lagoa Azul, or Blue Lagoon, is one of the more well-known diving and snorkeling spots on this island. Over here, you can swim with colorful seahorses as well as turtles and angelfishes. If you’re feeling more adventurous, you could also pay a visit or two to its various underwater coves. You could even pass through a bunch of shipwrecks in the area that were left as a result of pirates waging battles against the Portuguese. Up next we have The Big Island in Hawaii, just one of the many awe-inspiring areas in this part of the world that allows activities like snorkeling and diving. Being one of the most obvious destinations on this esteemed list does not detract any value to this amazingly beautiful spot. Aside from being picturesque, The Big Island also finds itself on this list by having more square footage than all the other islands in Hawaii combined. This means that it has the most to offer in terms of biodiversity. Not only are you getting your fill of turtles, fishes, dolphins, and corals whenever you visit here, you also get to brush up on your history. You can visit Captain James Cook’s landing spot on the island where there is also an abundance of colorful sea creatures. If you’re looking to experience more of the marine life here, another place to visit on the Big Island is the Honaunau Bay, where you could go and have a swim with the dolphins. So prepare your swimming trunks and dive watch and start your adventure! Rounding off the first five entries on this list is the Maldives. This place has become a hit among watersport enthusiasts and honeymooners alike in the past few years thanks to the largely untouched beauty of its beaches and diving spots. There are over 700 species of fish that call the Maldives their home. This includes butterflyfishes and tuna. In the Maldives’ many islands, you’ll also get to see sharks, turtles, octopuses, and of course, coral reefs of all shapes, colors, and sizes. The water in the Maldives is so clear and calm, in fact, that even the non-snorkelers you’re with can enjoy what lies beneath the waves. They can easily see the plant and animal life that inhabit the sea floor by simply looking down at their feet. Hopefully, seeing this encourages them to explore a bit more or even build up the courage to put on some snorkeling gear to take a closer look. 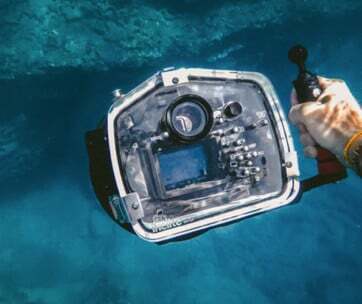 Make sure you bring your waterproof camera so you can take breathtaking photos. At number six, we have the Galapagos Island in Ecuador. If you’ve “been there” and “done that” when it comes to seeing the corals and smaller fishes, then this island offers a very different type of snorkeling experience. Much bigger sea creatures take the reins here in Ecuador. When you snorkel here, you get to see sea lions, sharks, and dolphins. You’ll maybe even get to see a penguin pop up every now and again. Of course, there’s also the typical snorkeler’s fare, but this place has so much more to offer. There’s no wonder the famed evolutionary scientist Charles Darwin based his most prolific theory around this area. The Galapagos Island features hundreds of different species of animals both under the sea as well as on land. The creatures here are also very friendly. Their lack of aggression is largely due to the fact that their habitat is remote and they don’t have that much human interaction. You can swim with or even pet a lot of the animals you find here. The Dominican Republic also hosts one of the world’s best snorkeling spots in the form of the Silver Bank. This area is in a shallower spot of the Caribbean Sea. Because of this, it is not accessible to large ships that may pose a threat to the sea creatures that have called this place their home for countless years. This is especially true for the North Atlantic humpback whale, which uses the Silver Bank as a safe haven to find a mate, give birth, and roam around. The Silver Bank is one of the few places where tourists can come face to face with this specie of whale. They can usually be found passing by here during the months between December and April. A list of the best snorkeling spots is not complete without a nod to the Great Barrier Reef located in Australia. This area is often hailed as having the largest coral reef ecosystem in the entire planet. There are 2900 individual reefs that make up this over 1400-mile stretch of natural beauty near the Australian shoreline. Aside from the abundance of colorful coral reefs, you’ll also be able to see marine animals such as barracudas, manta and stingrays, as well as parrotfishes, among others. If you’re not a big fan, or you’ve just grown tired, of observing corals and animals, then you’ll be happy to know that the Great Barrier Reef is also one of the best spots to see the remains of wrecked ships. To begin your journey, go to the Whitsunday Islands near Queenstown. From there, it’s basically a “choose your own adventure” thanks to how vast this place truly is. On the penultimate spot on the list, we have Isla Holbox in Mexico. Located just off of the Yucatan Peninsula, this snorkeling spot is also one of the top places for whale shark swimming. Contrary to what a lot of people think, whale sharks are actually a harmless bunch. You can mostly see them during the summer months, swimming near the surface so they can feed on plankton. This is the best time to get up close and personal with these gigantic animals. Isla Holbox is also famed for its environmental practices. For instance, there are no cars on the island, just golf carts and other non-mechanized modes of transportation. Last, but certainly not the least, we have the Philippines. The over 7000 islands of this bustling archipelago serves as the home to a variety of marine life. If you want to snorkel here, you should go to the province of Palawan, which is a collection of some of most famous of the country’s islands. You can go to the Bay of Donsol if you’re looking to swim with larger creatures like whale sharks. You could also go to Starfish and Cowrie Island too, as the name suggests, see various starfishes and cowries. You could also go to Tubbataha Reef to see corals and differently colored and patterned fishes swimming around. We’re hoping that reading through this list has inspired you to go try out snorkeling. As you can see, no matter which part of the world you’re in, you’ll never run out of beautiful places to dive in to.